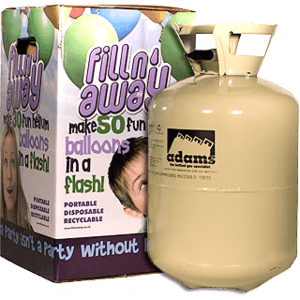 If you want the most flexible and cost effective way to inflate a small number of latex or foil balloons with helium, then our Disposable Cylinder 100 package is a great value option. The package includes two cylinders, only weighing around 4.5kg each. They are easy to transport if you need to take them to your venue and are extremely simple to operate. These cylinders will inflate a total of up to 100 9" latex balloons, 80 x 10" balloons or approximately 50 18" foil balloons, so perfect for medium sized celebrations or promotional events. Your cylinders will be delivered by courier and once you've finished with them, all you need to do is take it to your local waste disposal centre and they will recycle the cylinders on your behalf. Click here to compare all our disposable cylinders.